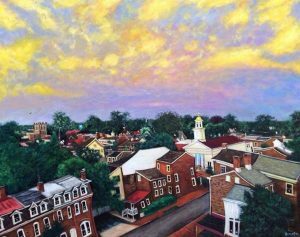 This Friday is “Gallery Walk” in downtown West Chester, which is “First Friday” on a huge celebratory scale. Every “First Friday” of the month galleries and local businesses have special art openings in Kennett Square, West Chester and Phoenixville, but only twice a year is there a West Chester “Gallery Walk” which turns the entire town into an art party from 5-9pm. Gallery Walk include paintings in watercolor, acrylic and oil as well as sculpture, photography, jewelry, ceramics, textiles and more. Local businesses with pop up shows include the new Rapidough restaurant, Boxcar Brewpub, Tish Boutique, and The Cat Hospital as well as 20 other locations throughout town. With big thanks to the West Chester Chamber of Commerce and the event sponsors, parking meters and the parking garages are all free during the event. Gallery Walk is rain or shine, and if history prevails, bring your umbrellas! Restaurants and pubs will be brimming with customers, so remember to make your reservations ahead of time. The West Chester Chamber of Commerce really does go all out to make this a fun, happy, successful art event for the visitors and for all of the businesses, so try to stop by some of the restaurants and shops that have helped to sponsor the big day. Along with the pop-up art gallery shows at 20+ shop locations, five prominent galleries will host new exhibitions throughout the downtown business area. Each of the art galleries provide a festive environment with complimentary food and beverages. And, for those of you who may shy away from gallery opening nights – this is the perfect day to jump in and see how much fun they are! Introduce yourself to the artists, mingle, and talk about what artworks you most enjoy. Buying art is always a goal of any artist or gallery, but openings and gallery walks are there for you to explore and have fun with art. Two West Chester gallery opening highlights this Friday 5-9pm are The Art Trust Gallery at Meridian Bank at 16 West Market Street, and The Church Street Gallery at 12 Church Street. 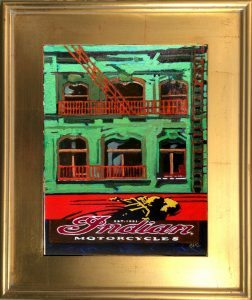 Indian Cycles by Brad Earl, is one of the fetured works at Church Street Gallery. 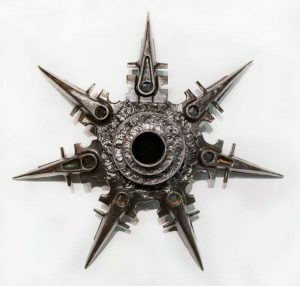 Starburst, by Stan Smokler, at Art Trust’s VIEW. The Church Street Gallery has a cocktail and opening reception for their new show with artist Brad Earl. Carol Giblin, owner of Church Street Gallery, writes that she has” been looking at this artist for some time and is very excited to show his work of 30+ some paintings in our gallery!” Brad Earl says that when putting paint to canvas, he is “both an architect with a painting hobby and an artist with an architectural hobby”. He is fascinated with old movie theaters and amusement parks of the 1940s which he says “harkens back to childhood memories of pure fun and adventure.” I have yet to see an exhibition at Church Street that was not remarkable, or meet an exhibiting artist who was not engaging and intriguing. It is so much more pleasurable to buy a piece of art when you have made a connection to the artist, as well as the artwork. The exhibitions and openings at Church Street are always top notch events. The 5-9pm opening reception at The Art Trust Gallery for “VIEW” at the Meridian Bank is a very big deal to 127 artists in the Chester County area. This month, “VIEW” presents artwork from a majority of the 127 artists who will be exhibiting during the hugely popular Chester County Studio Tour May 21 and 22. As you may know, The Chester County Studio Tour is an organized exhibition over two days, May 21 & May 22, of 127 jury selected Chester County artists showing in 53 art studios. There are studio maps, enticing “County Collector’s” pieces, food and wine and without exaggeration, this is the best art event of the year in Chester County. With The Art Trust “VIEW” exhibit, they provide a wonderful opportunity to get a taste, or a view, of the many Studio Tour artists from which you can decide what studios you would like to visit during the tour. With 53 studios spread throughout Chester County, you will need to plan ahead a bit, and a visit to The Art Trust is a great way to start. The Art Trust Gallery will be packed this Friday with art lovers and artists; offering catered food and Galer Estate wine. This may well be the hotspot for the Gallery Walk on Friday. Glory After a Storm by John Hannafin, at the Armory show this Friday. Also a definitely-interesting-stop-by event is at the new Armory Theater at 226 North High Street, where popular artist John Hannafin will debut his first Rap Video and Art Show with fellow artist and friend Bam Margera. The video premiers at 7pm sharp. John is well known for his sweeping panoramas, done in a Van Gogh-esque expressionistic style that is colorful, lively and touching. He played a bit from the rap for me on his i-phone. Great that he is trying new things. Sounds like a lot of fun at the Armory theater this Friday! Wherever you decide to start your own West Chester “Gallery Walk” this Friday, make sure to download a map from the Chamber of Commerce website: www.greaterwestchester.com! Furious Sky, oil on canvas by Kostantinos Damalas, will be featured at Mala Galleria in Kennett Square on Friday. If you head to Kennett Square this Friday, they also have fun “First Friday Art Stroll” with art openings from 6-9pm. Mala Galleria, at 206 East State Street, has an opening reception for their new show, “Around the World with 15 Artists”. Selected artists are from Greece, India, Serbia, Russia, Lithuania, South Africa and of course, Kennett Square. The works are a wonderful variety of styles, colors, mediums and prices. I know that there is a gorgeous watercolor painting there for only $150 that I will buy as soon as the show opens! On the next block, remember to visit The Longwood Art Gallery, and the studios of Peter Willard, Carol Lesher and Charlie Metzger. On Sunday, Mother’s Day, there is a lot to do in Kennett Square. Consider starting with a visit to the artistic horticultural displays at Longwood Gardens ( as well as Mother’s Day Brunch in the ballroom!). Then go to Galer Estate Winery, behind Longwood Gardens, where there is an art show, and artisan “Sip and Shop” with jewelry, ceramics, soaps, and metal work from 3-6pm. Jewelry artists Hattie Weselyk, Emily Pellini, Vintage Faerie, and 2Design Studios are all showing beautiful and unique jewelry. Just a couple miles down Route One, Ten Gallon Hat Winery has an art show of local art works from The Visual Expansion Gallery. Ten Gallon Hat Winery is in a beautiful, large building with terrific two story walls to display art. 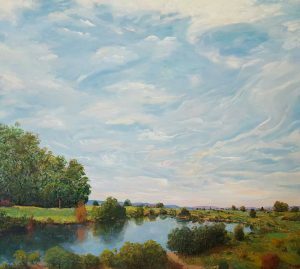 Just down the road from Ten Gallon Hat, visit The Brandywine River Museum of Art with your mother and family for the wonderful show of Hudson River paintings, as well as their new exhibit in honor of the Founder and Chairman of the Brandywine River Museum of Art and Brandywine Conservancy, Frolic Weymouth.